"ANDA TELAH TERKENA FB HANGIT DARI KAMI RileksCrew+H3x4 Crew+Newbie3vilc063s+Ha¢kin | Cr³w...."
With almost 800k of Hot FM facebook fans it seems like the security is not strong enough to prevent people hacking the FB page. RileksCrew seems like one of the IT guy that wanna show off their skill in hacking the page. What's the reason your Facebook Page was hacked easily? Easy-To-Guess-Password. Maybe HotFM Facebook has an easy to guess password like "HotFMMY"? You have multiple admins on the Facebook Page. It is good to have multiple admin for a page if you need quick response to the fans, but it also means that the more people have access to it the easier the page could be hacked. You won't know ho is the culprit easily. Not being careful in hiring people who manage the FB Page. The boss should be very careful in hiring people nowadays because the admin for Facebook page will affect how the whole company present themselve online. Background check is important right? Don't leave your computer/laptop with Facebook logged on alone. There are so many people like to TweetJack and FacebookJack. So keep an eye on your belonging cos people may wanna do further damage using your personal account or event change the password. 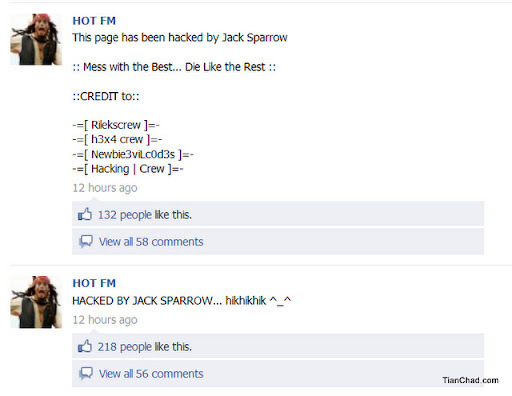 So...Will the so called RileksCrew hackers return the page back to HOT FM? Or... do you think this is part of the Pirate of Carribean 4 marketing gimmick? After all, make sure your password for your Email, Facebook, Twitter +++ are all unique and hard to guess all right? Or else not only Jack Sparrow will able to hack your Facebook and Twitter, your bank account's hard earn money might also gone! PS: Don't simply click on the link being shared on HOT FM Facebook page now. Or else you will experience something funny on your web browser.